SAW017926 SCOTLAND (1948) [Unlocated]. Unlocated image of haymaking, Dunbartonshire. An oblique aerial photograph. Pennawd [SAW017926] Unlocated image of haymaking, Dunbartonshire. An oblique aerial photograph. This is a farm track leading out to the north of Shovelbread Farm - 55 53 23"N 004 34 42"W - located to the east of Kilmacolm. The Google Earth photo shows the distinctive track and the stream which starts from a spring just to the west of the track. 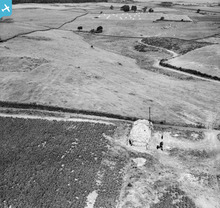 The farm is currently called Shovelboard, but the old OS maps have it marked as Shovelbread. The aircraft was flying south westerly just to the south of the farm and photographed it looking 290T - see photo SAW017926 - and then snapped this photo of the haystack looking 330T. I suppose it is near Dumbarton but this cost a lot of fruitless searching north of the Clyde. I presumed the aircraft was based at an airfield to the west of Renfrew - now the current site of Glasgow Airport,and probably took the photos on an opportunity basis just after take off or landing. Who knows? Three cows chewing the cud and watching the plane. 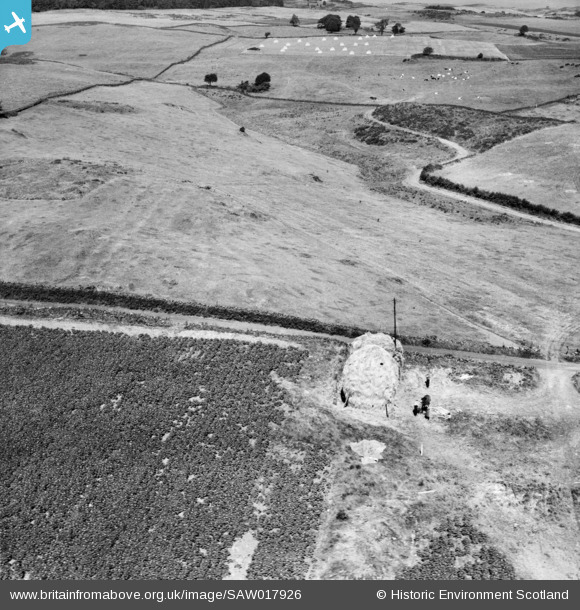 This is the same location as Image reference SAW017925 (Unlocated farmstead possibly near Dumbarton). Taking a much needed rest from the haymaking.